U.S. Senator Mike Crapo received a friendly welcome from Republicans at an Idaho Falls luncheon Friday, with warm introductory remarks from fellow Senator Jim Risch and an endorsement from Congressman Raul Labrador. Risch also praised his Senate colleague. “I didn’t realize this was going to be Say Nice Things About Mike Crapo Day,” Crapo quipped. After lunch, Labrador said he wanted to address the challenge rumors, which had been swirling in DC for months. Congressman Mike Simpson is attending meetings in DC and won’t be able to make it to the central committee meeting, a staffer said. 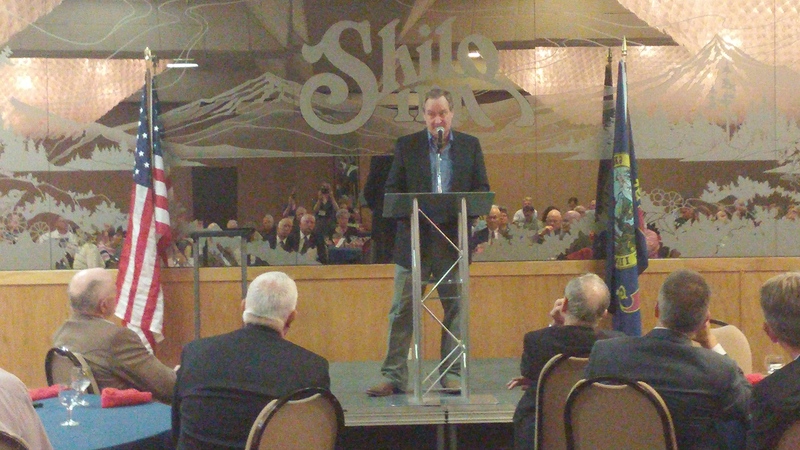 Yesterday, former gubernatorial candidate Russ Fulcher announced his endorsement of Crapo. ” Overall, the federal government has been headed in the wrong direction, but Mike Crapo has demonstrated integrity in taking steps to reduce all three,” Fulcher wrote. The State Central Committee meeting is different from the party convention, which happens every two years. At the central committee meeting, members consider party rules and resolutions. On Friday evening, Republican presidential contender Sen. Marco Rubio will address attendees. The event also includes an afternoon at a local gun range and training on precincts, data and parliamentary procedure.